2012 is sure to be an important year in the history books. Not because the Mayans predicted that the world might end (! ), but because there are several major elections and leadership handovers across the globe this year, including the U.S., France, Russia and China. As this Economist article notes, politics happen on two levels: 1) The immediate power struggle of which party wins and who becomes a leader; 2) The underlying power struggle of which ideas and dogmas win. 2012 will very likely be a year where both levels of politics lead to all sorts of power clashes. Ostensibly, this tension could force recognition of the magnitude of our economic issues, and thus real solutions. Or the media circus of politics could distract us from the true economic challenges at hand. After a New Year, people love to prognosticate. As Niels Bohr famously said, "Prediction is very difficult, especially about the future." Even more so about the future of a year that could go in a multitude of disparate directions. Perhaps it's better for us not to pretend to be psychics, but rather focus on how we can find some sort of control amid possible chaos. The elections and power struggles upcoming in 2012 got us at Leyendecker thinking about leadership, not on the global, or even national level. But on our level. It's clear we need strong leadership in 2012. But a recent study also shows that confidence in our leaders has hit another all-time low. When our own ability to impact leadership on the national, and much more so on the global level, is limited at best and disillusion is high, it seems far more productive to focus on transforming ourselves into great leaders. The objective is to provide stability and success in our own lives and for those around us, who can in turn find the motivation and inspiration to do the same. Elections suggest that leadership starts from the top down. But we believe the most capable leadership starts from the bottom up. One can only lead successfully after wearing the shoes of those following. In fact, it must start from the bottom if we hope to restore responsible leadership and serve as models for younger generations. As we start a new year, we are resolved to challenge ourselves to become better leaders, whether in the immediate, or to position ourselves for great leadership in the future. To begin, we've been devouring all sorts of ideas on the topic. We encourage you to do the same. As a starting point, please see the section below dedicated to Leadership & Motivation. Without the great drama and fanfare of more recent economic fixes, the Federal Reserve and the ECB may have recently put together a rather capable patch to the fear of financial contagion and economic implosion. Don't look now, but the sovereign default issues of the last few months may soon find their way back into the closet. The Fed has opened the dollar swap market to ensure European banks can obtain dollars when needed. The ECB has lowered their discount rate while concurrently opening the doors for European banks to pledge every piece of trash debt for very low interest loans. Removing this trash debt from European bank balance sheets enables the banks to purchase new sovereign debt that is issued to refinance previous debt that is maturing. In theory, it all works very well: Banks take trash out the back door so they can buy more trash through the front door, which they can then later take out the back door in order to make room for even newer trash. The ECB holds the trash until it is refinanced with new trash. Then banks can use the new trash as collateral to borrow more money to buy even newer trash, which they can pledge to the ECB as collateral...You're following this logic, right? The big difference between today and just a few weeks ago is that now European banks are going to reallocate their sovereign debt holdings primarily to that of their own country. So if Italy defaults, they just default to themselves. Should this new scheme work, financial contagion risk will contract significantly. Only time will tell if the Europeans can pull this off, but one thing still seems pretty certain: There are no apparent organic catalysts for economic growth at the moment. With no growth, debt will never be paid off and outstanding social promises will only be kept by increasing debt. But once a country only risks default to itself, then growing sovereign debt and debt-to-GDP ratios become much less of a global issue. All one has to do is look to Japan, a country currently with a 200% debt-to-GDP ratio. With Europe's overall debt-to-GDP ratio hanging around 90%, there seems ample room for European economic "growth" to continue and the global financial and economic system to remain intact. Austerity? Well, that will also likely find its way back into the closet again soon. Isn't playing Monopoly fun when you can just create new money out of thin air? The potential for some measure of economic and financial stability to return after recent Fed and ECB actions notwithstanding, the investment markets seem tremendously skittish. Not a favorable mood for hiring. It's almost like it was only recently that investors realized the entire global economic system has been on the edge of collapse for a good while. That revelation has banks, investors and companies in a rather insecure position. Again, not a great mood for hiring. European banks, which are unofficially bankrupt, must repair their equity base. The ability to borrow from the ECB at 0.5% and use that money to buy "risk free" sovereign debt at 5.5% will become the capital allocation strategy of choice. Already, European banks are tossing U.S. corporate loans like a hot potato, not good for hiring in the traditional bank market. Furthermore, with so much of Europe focused on austerity, the U.S. and other global economies will be challenged to grow at levels that encourage a great deal of hiring. For now the hiring market in finance seems to be focused on selling the news of being on the edge of economic collapse rather than buying on the rumor of a possible fix by recent Fed and ECB action. But should financial contagion risk subside, we could see the finance hiring market pick up considerably later in 2012. Intellect is the desire and capacity to learn. One must have both to possess a high intellect. Intuition is the ability to read between the lines. Where do you find this on a resume? Initiative is the innate desire always to do more than is expected. Wouldn't it be great if everyone possessed this quality? And integrity is what everyone believes they personally have, but few people really do. Nuff said on that one. Hire people who rank high in these four I's, and you'll have a diamond employee. Develop your own personal capabilities in these four I's, and you'll have a very successful career. The recent Charities Aid Foundation's World Giving Index puts the U.S. at the top of the most charitable nations list after being fifth last year. 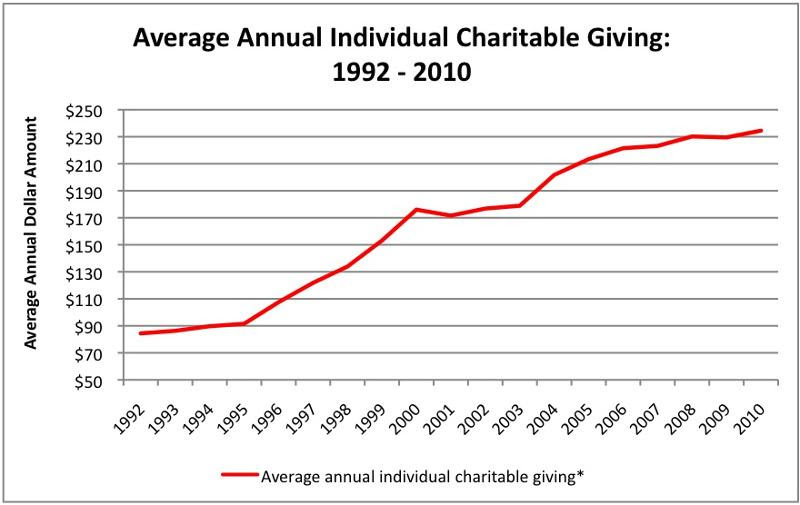 We became curious about how much on average individual Americans donate to charitable causes per year. The number has been steadily climbing since this data began being collected in 1992. We were heartened to see that despite years of economic hardship in the U.S., Americans continue to give and give more. For the full global charitable giving survey results, follow this link to download a PDF of the report. For Welch, career success and earning a leadership role is about one thing: over-delivering. When your boss asks you to do something, take it upon yourself to broaden the task. In other words, instead of simply answering the question in a straightforward way, use it to ask more questions and address it within a larger, more informative and more enlightening context. To impress, Welch says you have to broaden your job to exceed expectations. As the companion piece to the video linked at the top of the newsletter, this HBR article asks if ineffective managers can transform into successful and inspiring leaders. The people behind this study found four metaphors that are a useful tool in providing a framework for people to consider, expand upon and improve their leadership style: fire (representing ambition), snowball (accountability), mask (authenticity), and movie (self-reflection). Read on for case studies about how each metaphoric tool helped people evolve from mediocre to stellar leaders. In keeping with metaphor, Commandant Papp uses lessons from the sea to inform his notions about what it means to be a great leader in business. Sea life has revealed to Papp what he believes is the most important asset to great leaders: people. When there are storms - literal and figurative - "Out at sea," he notes, "you're disconnected from everything you're familiar with. You've got to rely on the people with you out there." Being a captain has framed how he views the world, which is one where you can't get a job done by yourself. To Papp leadership is about bringing out the best in people, which means preparing people to do their jobs well, giving them a strong sense of responsibility, and holding them accountable. Chicken or egg, which comes first - the leader or the environment that makes him? Successful entrepreneur and author Margaret Heffernan argues it's all about environment. She's had tremendous success hiring people who've gone on to be great leaders and entrepreneurs. She argues their future success was less about spotting great talent early on, and more about creating the ideal circumstances in which talent and leadership were best encouraged and developed. Read on for her thoughts on those circumstances that foster great leaders. As Commandant Papp said, you can't get a job done yourself. Thus, leadership is largely about keeping those around you motivated. This can be especially challenging when cash is scant, but remains crucial to the viability of any company. Not everyone knows how to motivate and inspire. This entrepreneurial author admits he is not a natural motivator, so he hired someone who was and this person transformed the company's culture into one where people were committed and passionate. Read on for nine motivation tips, like getting rid of project managers to increase across-team accountability and pouring on the praise. And now 10 ways to motivate top talent...to quit and find a new employer. Keeping top talent is a two-way street. Employees must deliver and add value. But employers must also try to keep top talent happy. With top talent becoming harder to find, the best companies will prioritize creating a work environment that makes people want to stick around for the long haul. Examples include showing an interest in your employees' career development, which indicates to employees that you want them to grow with you. Author and former hedge fund manager Andy Kessler asks an interesting question: Does being rich really matter anymore? He makes the point that getting rich requires serving a mass market so that the mass market can afford to buy pretty much everything that the rich can as well. Consumption, particularly of those technologies that afford so much modern convenience, has become more or less equal to all. So then, what does it mean to be rich anyway? Thanks to a rush of construction following Qaddafi's demise, Libya's economy is expected to be the fastest growing of the New Year. China is slated to continue to see solid growth; growth in global-demand of their exports will help offset their mounting economic problems. Sudan, Greece and Portugal round out the top 3 countries expected to see the most economic contraction. Follow the link to see the other predicated top growing and shrinking economies for 2012. We learn more from our failures than we do from our successes, as the saying goes. And this is precisely why Jeff Stibel, CEO and author, prefers to hire people who've known failure at some point. Those who've had only success might not necessarily know why they succeeded. Failure opens people up to a greater understanding of the whys and hows of different outcomes, while forcing more self-appraisal and self-improvement. On a company culture level, openness to failure can make for an environment where risks and possible failures are a welcome, and often necessary, part of the evolution and expansion of any business. A poll of 1,050 CFOs from global public and private companies across industries expect U.S. employment to increase by approximately 1.5% in the next year, bringing unemployment down to 8% by year's end. The survey found CFOs expectedly pessimistic about employment growth in Europe, as well as having only tepid expectations for employment growth in Asia. At the start of each month, the BLS Commissioner releases a snapshot of the employment situation. In it, the Commissioner outlines the key data points in employment and unemployment based on the most recently collected numbers for each super sector, as well as other key indicators, like the labor force participation rate. Follow the link for the statement, as well as access to the full report.